When the Carnival Elation left Long Beach last year to go to New Orleans, Carnival introduced the Carnival Imagination to the West Coast. 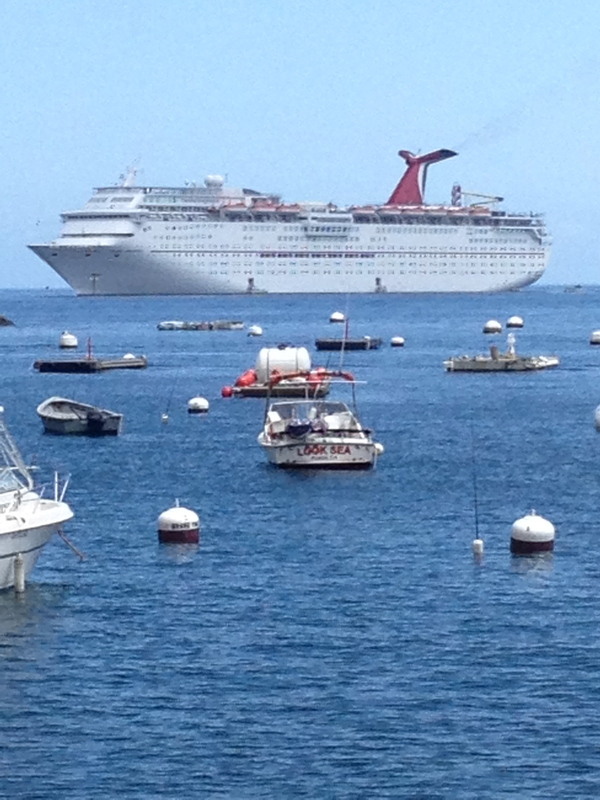 The Fantasy class ship leaves the port of Los Angeles on Sundays with as many as 2056 passengers and 920 friendly crew members for a four night cruise with stops in Catalina Island and in Ensenada. When it returns on Thursdays, it docks back at Long Beach to refuel, restock, clean up and get ready to greet new passengers for a three night cruise to Ensenada and back to home port. 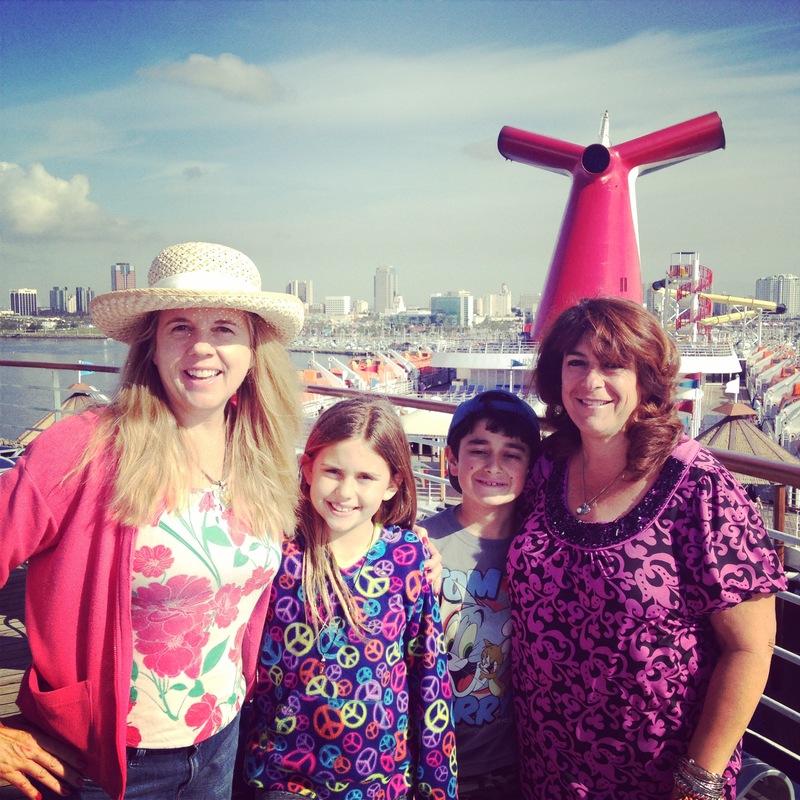 During Spring Break my family and I sailed on a four night cruise. Checking into our room U 42 offered the ideal cabin for my daughter and I. Two twin beds in a “L” shape, writing desk, television, large window, plenty of closet space, bath with a large shower and safe in the closet. Our room steward “Rama” from Bali was a sweet woman. She kept our cabin fresh and clean throughout the cruise. After the safety drill, we dressed and went to the Your time Dining – American Table. It was just unveiled on February 16, 2014 with a new culinary menu. Located in the Pride Dining Room allows guests to dine from 5:45 p.m. at your leisure, however if you come after 6:15 p.m. be prepared to wait for up to 45 minutes for a table. Ask for Leo and Oswaldo’s table. They will give you wonderful service. The American Table menu on the Carnival Imagination offers four appetizers that include seared tuna on a noodle salad with sesame dressing and vegetable spring rolls with a Vietnamese dipping sauce. There are tapas for the table meant to be shared with others that include fried calamari or flatbread with caramelized onions. Each night is a rare find dish, such as spicy alligator fritters with a tropical tomato salsa. It’s a food that your may have always wanted to try, yet never dared to order. Now it the time to be adventurous. Also on the left side of the menu is a list of featured wines From a Moscato from Pavia, Italy, to California Chardonnay by Kendall-Jackson. Main dishes featured are braised beef short ribs, sweet & sour shrimp, beef lasagna and a vegetarian chickpea biscuits with roasted squash and peppers. They serve grilled Mahi Mahi fillet, flat iron steak chicken breast and pork chop. Each can be accompanied with a chimichurri, BBQ sauce, Bearnaise, peppercorn, roasted garlic or tomato tapenade sauce. The first night the Port of Call was in Los Angeles. Nicknamed the City of Angels, Los Angeles is often billed the “Creative Capital of the World.” Food culture in Los Angeles is a beautiful fusion of mixed cultures influenced by a melting pot of creative new restaurants Mexican food is blended with Asian cuisine. Peruvian food is the rage paired with creative cocktails. The menu offered the ultimate Margarita blended with 1800 Reposado 100% blue agave tequila mixed with Cointreau with lime juice and salt. There were duck potstickers and miso marinated salmon with a sesame rice cake, bok choy and ginger soy vinaigrette. Under the Rare Finds section on the menu was spicy alligator bites, frog legs and escargot Bourguignonne. Sides were roasted corn and vegetable succotash, lo mein noodles, sauteed beans with bacon, whipped Yukon potatoes or green salad. For dessert, the Nutella Tiramisu was a sweet ending to a surprisingly new and improved culinary menu. 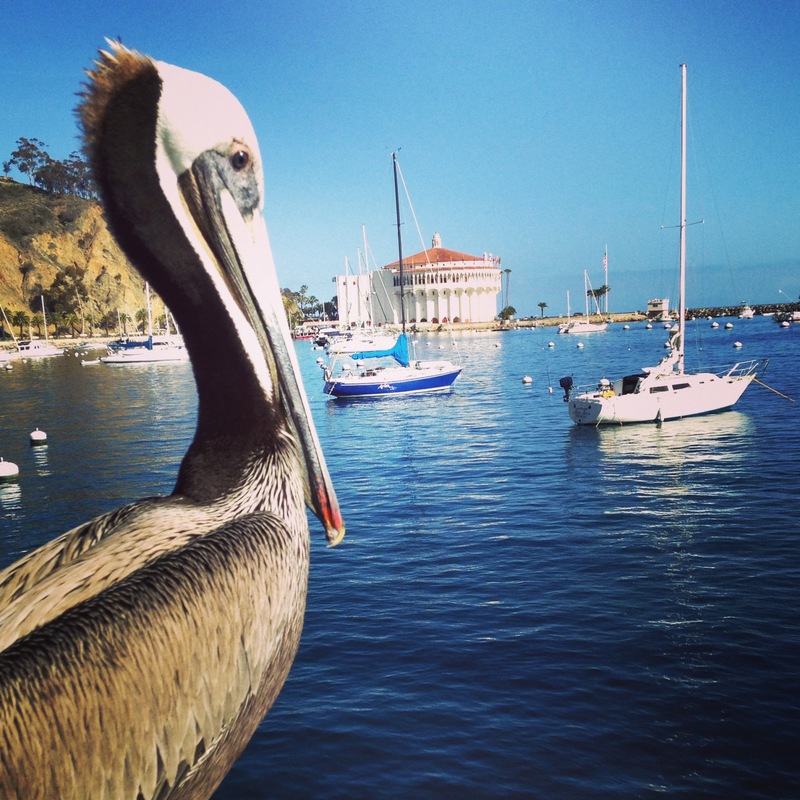 Our first stop was in Catalina Island. The ship anchors in the Pacific Ocean near the historic island and Shore Boats tender passengers to the Green Pleasure Pier. Once on the pier we walked into town to catch a shuttle trolley for a one hour tour of the city of Avalon with various stops along the way. Sometimes we stopped for 10 minutes to investigate the surroundings, other times we stopped just to pick up or drop off passengers. The trolley takes guests to the beautiful Catalina Casino that was built in 1929 as a dance pavilion, not a gambling casino. Further out is Descanso Beach where the Catalina Zip Line Adventure begins. There is construction right now at Descanso Beach for a new Beach Club. Inside the Catalina Casino is an informative museum to learn about the history of Catalina Island. William Wrigley of the chewing gum empire bought the island. He had his Chicago Cubs come here for their Spring Training. Marilyn Monroe lived on the island with her Merchant Marine husband when she was just 16 years old. Also, the actress Natalie Wood died when she drowned near her boat near the island. 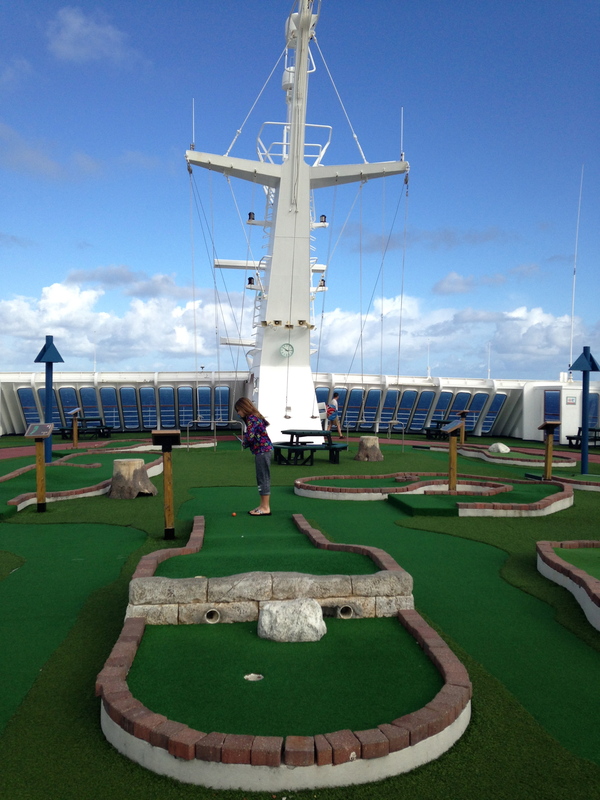 Before going back on the Imagination, we played 18 holes of golf at the Island’s miniature golf course. Back onboard we enjoyed another American Table dinner before a terrific pop rock show in the Dynasty Lounge: Divas. The singers and dancers dressed in high fashion costumes performed Lady Gaga, Beyonce and Brittany songs. It was worthy of a Las Vegas show. The next morning we walked off the ship and explored Ensenada, Mexico. Many guests on the Carnival Inspiration book an excursion to horseback ride in Ensenada, go wine tasting, see the blow-hole or take a city tour. We explored the town by foot. 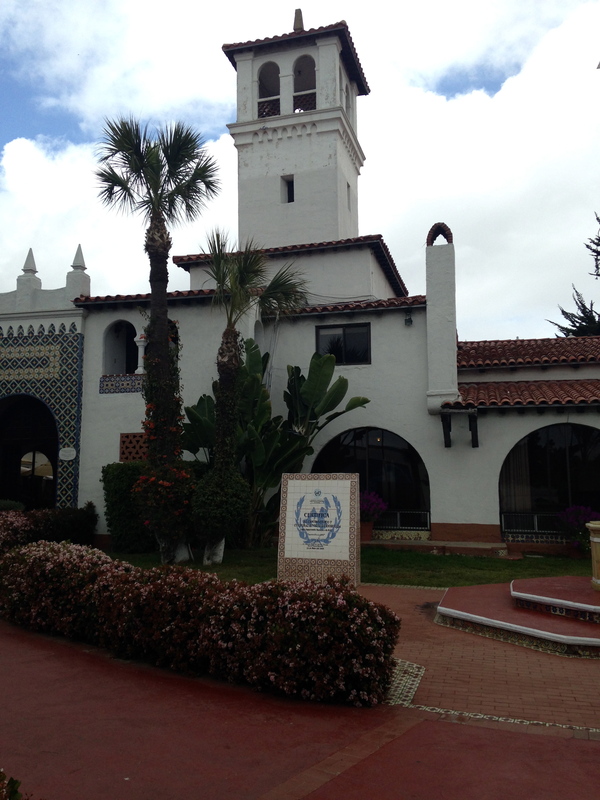 We started at the end of the cruise terminal with a visit to the Ensenada Historic Museum located inside the exquisite 1930’s Riviera de Ensenada. Once a luxurious hotel and casino, this Mission style building was initially operated by the heavyweight boxing champion, Jack Dempsey. The museum depicts rock caves with interesting mural art, a replica of a mine and various exhibits of colonization by missionaries and early European settlers. Next, walk towards one of the tallest flag poles in Mexico. It reaches 338 feet at the top and the National flag measures 164×92 feet. It weighs about 265 pounds. The nearby National Civic Plaza has three bigger than life sculpted gold heads of Miguel Hidalgo, Benito Juarez and Venustiano Carranza. Each man has significance in Mexico’s history. I picked up a map at the Visitors Information Center on Bulevar Lazaro Cardenas (Costero) and Avenue Gastelum. 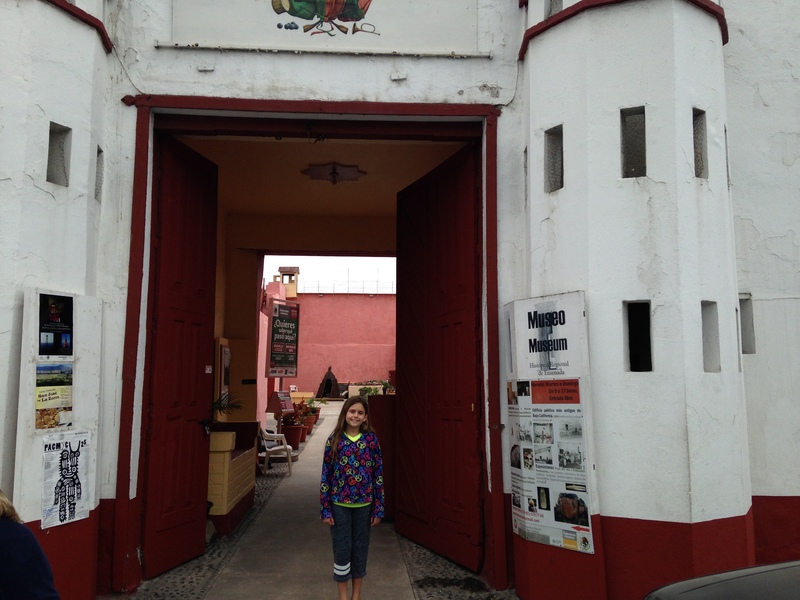 We walked up the street to the Regional History Museum of Ensenada. It’s the oldest public building in Baja California. Built in 1886 with adobe, it served as military quarters where soldiers lodged, a hospital, the local jail and a school. This building now belongs to the National Institute of Anthropology and History. When this complex was a jail, prisioners could pay for a cell upstairs rather than stay in several “holding” tanks. They were allowed to decorate their cells, adding personal touches, such as tile and hand paintings on the walls. Walk into some of the cells and you can detect a wall painting of a bay with trees and mountains. In another cell we saw a portrait of a beautiful woman with a church, moon and clouds in the background. Currently part of the old prison offers an exhibit of lighthouse photographs. There is also a giant lighthouse beacon. Upstairs, the second floor used to be the offices of the District Judge and a guard tower. It also was housing for pisoners who could afford to pay for a room. There was an earthen oven for baking bread. Near the port is the Old Customs House. It was built in England, shipped and assembled in Ensenada in 1887. In 1922, the building was owned by the Marine Customs Office. In 1992 the building was given to the National Institute of Anthropology and History. It now exhibits items recovered from the lost Galleon the San Felipe that was wrecked in Baja California in 1576. It’s an interactive spot for families, with an excavation box with items that are similar to what was recovered when the wreck was found. There are beautiful blue and white porcelain displayed in glass cases. Many were rice and soup bowls. On one wall is an interactive game with magnetic “Galleon” game markers called The Manila Galleon Game. The object is to roll a dice in a wood box and move the galleon the number of spaces rolled. Read aloud the events that took place where you land to learn about the galleon voyages. Each space is equal to about one week at sea. The game takes about 10 minutes. Land at one spot and learn the scurvy killed 208 people on one ship with only 192 surviving or in 1696 the sea surged with such high waves that 12 men together could barely steer the ship. Back onboard we played miniature golf up on the top deck, before getting ready for another interesting American Table dinner. Afterwards, we went to the lively Hasbro The Game Show, where guests go onstage and win prizes. It was great fun. Many people despair that on Sea Day there won’t be enough to do and they will grow bored. On the Carnival Imagination, exercise classes start at 7 a.m. We woke up and played 27 holes of miniature golf before breakfast. The course was practically empty and it was invigorating to get fresh air first thing in the morning. We went down to the Pride Dining room for on open seating Sea Brunch offered from 8:30 a.m. to 1 p.m. It’s a different menu than what is offered most mornings. Afterwards we learned how our cabin steward folded our towels into elephants, swans and dogs in the Dynasty Lounge. The staff encouraged guests to come on stage to learn how to make adorable animals from white fluffy towels. Immediatley afterwards was a puppet show by four folded towels that was quite entertaining. 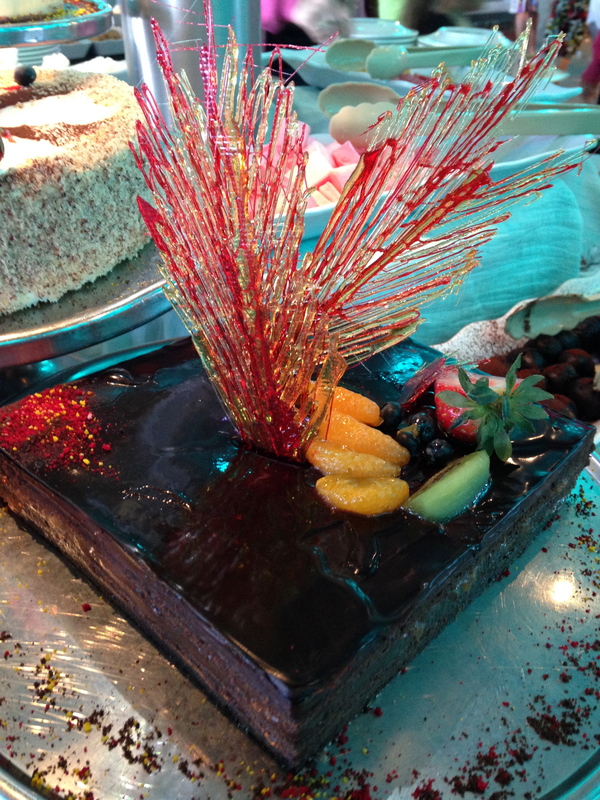 There was a second episode of Hasbro The Game Show, a chocolate extravaganza up on the Lido deck with various chocolate desserts, a chocolate fondue with fresh fruit and donuts to dip into. We joined three other teams in the digital scavenger hunt. For 20 minutes, we raced around the ship to take a picture of a wall of candy, smiling bar waiter or waitress and the golf putting green. There were a total of 25 items to take a photo of to show the activity director. The winner received a trophy of the ship. On the last night of the cruise, the library is turned into an elegant dining room for a Chef’s Table Dinner and Wine pairing for $75 a person. Unless you find the table up on the Lido deck on the first day of your cruise, you will never know about it. It’s an exquisite dining experience for foods and culinary afficianados who want to go beyond the regular dining experience on a cruise ship. After dinner we went to Punchliner Comedy Club presented by George Lopez to watch a family friendly show and then went to the Dynasty Lounge to see Epic Rock a fantastic 1970s and 1980s rock show that debuted on our cruise. It was sensational. The next morning the ship docked in Long Beach and guests leisurely disembarked. It’s less stressful now to leave your cabin in the morning. You can still enjoy a nice breakfast in the Pride dining room, play one more round of golf and walk off the ship around 10:30 to 11 a.m.